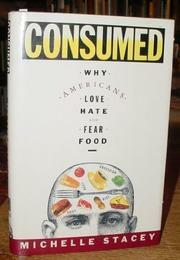  Stacey, a magazine journalist, contends that Americans have become paranoid about food, especially about fat, and that our fears have taken the pleasure out of eating. To support this contention, she marshals Julia Child, who complains about our ``fear of food,'' and chef and cookbook author Jacques PÇpin, who claims that we are ``berserk about food.'' Stacey thinks we might be ``surprised'' to learn of similar anxieties felt by diet reformists of 100 years ago. We're not, if we've kept up with other popular food histories of recent years. Nor is her closing recommendation, for moderation and emulation of traditional diets, so different from that of the nutrition-minded authorities she scorns. She certainly exaggerates the ``paranoia,'' pretty much ignores its objective causes other than the fat factor, and sometimes backs down on that, conceding in places that too much fat is ``not good for anyone.'' Her opinionated assertions and assumptions can be annoying to readers who can't answer back. Still, she writes well and has an intelligent grasp of her material, and the heart of the book is meatier than the bracketing position papers. Her chapter on the case against fat gives a fair and succinct review of major studies. Other chapters based on interviews report on the problems of the product Simplesse and other fake fats in getting the taste and texture just right; the failure of Quaker Oats to hop off the oat bran wave before it crashed; and the ongoing research into and development of ``nutraceuticals'' (probably destined for pill form) and ``designer foods'' such as anti-cancer juice drinks (with concentrations of, say, beta-carotene) and bread made with flaxseed (high in heart- healthy omega-three fatty acids and other disease-fighting nutrients). Without thumping, Stacey touches on the practical and philosophical, not to mention aesthetic and culinary, questions these endeavors suggest. She also casts a cool and knowing eye on eating disorders and on overzealous restaurant-goers, though these chapters are less informative. In all, provocative and accomplished.